Growing up, Leela Ayyar had always been fascinated with the night sky. Her love for the stars quickly expanded to all of the sciences as she grew up. 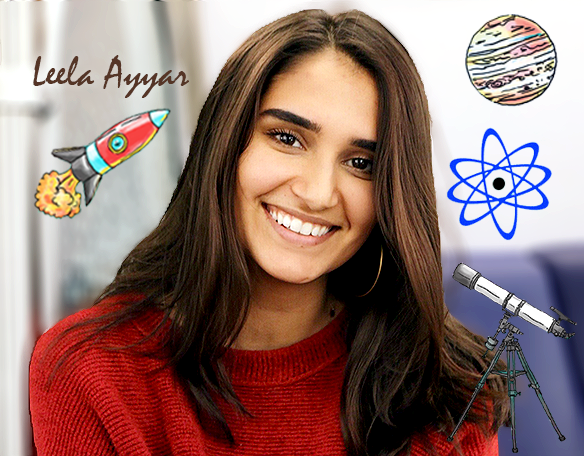 Inspired by the challenges she and her younger sister experienced as STEM girls, Leela wrote Elara, STEM Girl to not only encourage girls to take an interest in STEM but to help them overcome any obstacles they may face! When Leela is not at college studying aerospace engineering she lives in Oakton, Virginia with her family and dog Devaki. Do you love my book? Would you like me to autograph it for you? Would your school like me to come and do an author visit? I’d love to hear from you! My valued readers are my top priority. Use the form on the left to send me a note. I’ll make every effort to respond to your inquiry in a timely manner and even accommodate your autograph requests.